Warm up your heart with this amazing berry cobbler that takes only 10 minutes to prepare. 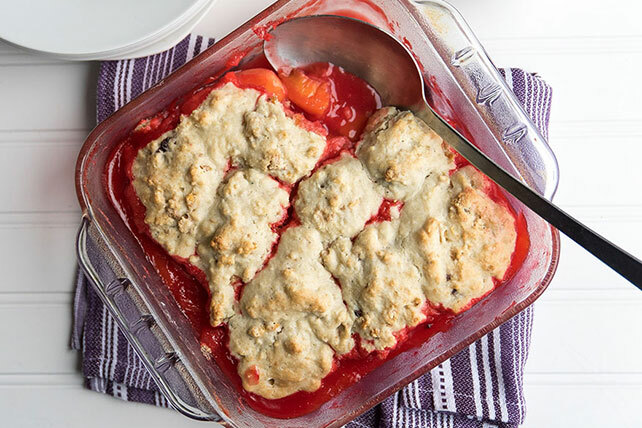 Your family is going to love Warm Peach-Berry Cobbler. Heat oven to 375°F. Mix flour and water with whisk in large saucepan. Bring to boil on medium heat, stirring constantly. Stir in dry gelatin mix, 2 Tbsp. sugar and fruit. Pour into 8-inch square baking dish. Mix baking mix, remaining sugar, cereal and milk just until moistened. Drop 8 heaping spoonfuls of dough over hot fruit mixture. Bake 30 min. or until golden brown. Cool slightly. Serve topped with COOL WHIP. Refrigerate leftover cobbler. Prepare using 4 cups sliced fresh peaches. Bake cobbler as directed; cool completely. Store in refrigerator. Microwave each serving in microwaveable bowl on HIGH 20 sec. or just until warmed. Substitute 1 pkg. (16 oz.) frozen strawberries for the peaches.